Today AddThis released a new, easier way to share to Pinterest, as well as some of the fascinating stats we've seen for this very popular service. If your visitors already use Pinterest and have shared using it anywhere on the AddThis network, Pinterest will show up as one of their "preferred" (personalized) services automatically, no work required. Huzzah! If you'd like to explicitly add Pinterest to your site so it always shows up, read on. First, let's head over to AddThis and pick the tool we'd like to use. Be sure to pick "Blogger" so you get the right code that automatically takes into account Blogger's multiple posts on your home page and other nuances specific to this platform. 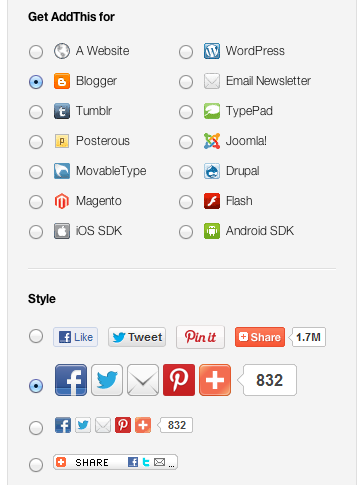 I like to use the large sharing icons at the bottom of my posts, so let's grab the second choice in the list. 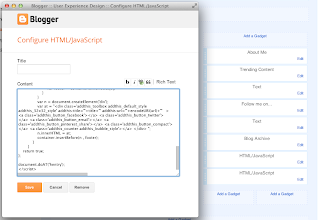 Then, installing the code is as simple as clicking "Install Blogger Widget". 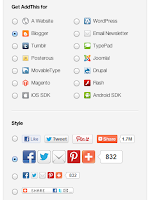 If you have more than one blog, Blogger will ask you to confirm which one should get the widget. Tip: Leave "Title" blank, unless you want to give the sharing tool a label like "Share this post"; personally these days I don't think it's necessary, as most folks recognize Facebook and Twitter for what they are. That's it. By default, AddThis will use "preferred services" for each of the icons, so your visitors will see their favorite options, including Pinterest, or a default set of the most popular services. If you'd like to instead make sure that specific services show up such as Facebook, Twitter, or Pinterest, all you need to do is edit the code inside the widget you just installed. 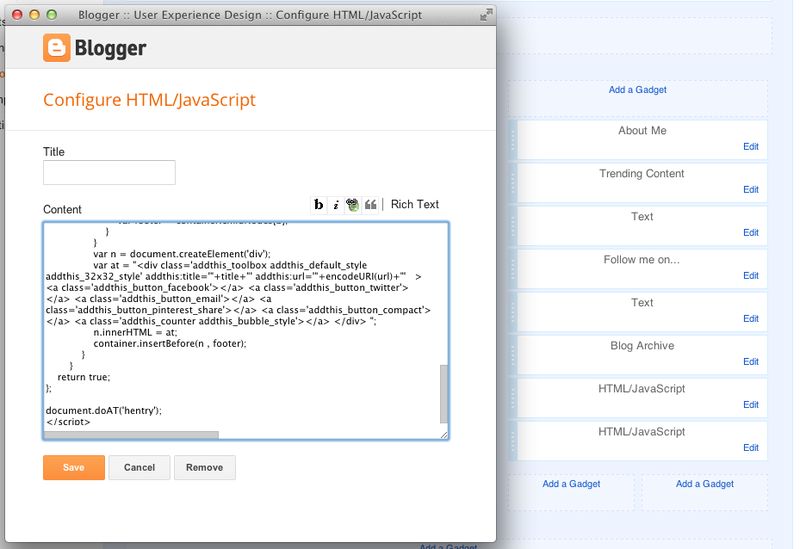 First, select "Layout" to edit the widgets and layout of your blog. Scroll down through the code in the content field until you see code like what I'm showing to the left. I've changed each instance of "addthis_button_preferred_x" to "addthis_button_facebook", etc for each service I wanted to specifically display. If you'd like to show the Pinterest "Pin It" button, use "addthis_button_pinterest"; if you'd instead like the 32x32 Pinterest icon, use "addthis_button_pinterest_share". That's it- enjoy! Presumably you're happy with the legal ramifications of your involvement in any copyright infringements perpetrated using your tool?